Khargo has grown! We are thrilled that we have been able to extend the store and now we have the opportunity to put out our Out of Sim builds - Kiha Gazebo and Laka Island. The beautiful Kiha Gazebo is made with a menu that lets you change textures (over 70 textures included), tint, shininess, glow and brightness. This way this gazebo can be changed to any style you want. The owner also has the option to make the menu available to everyone or only to himself. This menu is activated by clicking on the rock. The gazebo has place for 2 single animations and 1 couple animation, so 4 in total. It also has the option to switch between different couple anims and single anims. This is done by simply clicking the cushion you sit on. That way a blue menu will pop up from which you can choose your next animation. The cushions will automatically also change the pose of your partner. Kiha is made with the best sculpties, textures, scripts and animated poses SL has to offer. - 2 spots with couple poses with 16 different animated poses. - texture, tint, brightness, shininess and glow changeable in 3 groups (rocks, gazebo and cushions). Next is the Laka Out of Sim Island. Laka is also designed to be used out of sim and is purely decorative. This island is made with a menu that lets you change textures (10 textures included), tint, shininess, glow and brightness. This way this island can be changed to any style you want. The owner also has the option to make the menu available to everyone or only to himself. This menu is activated by clicking on the rock . This out of sim island is made with the best sculpties, textures and scripts SL has to offer. - texture, tint, brightness, shininess and glow changeable in 1 group (rocks). 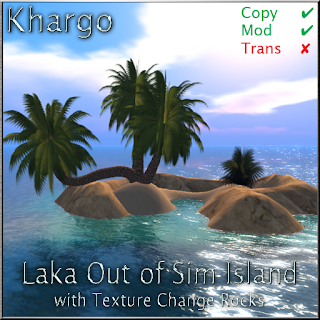 Visit Khargo to see these gorgeous islands in world or check them out on Xstreet.